I’m so blessed that many readers have wholeheartedly embraced and welcomed Sam (Lewis) and Lexa (Clarke) and their lively TeamWork crew into their lives! Sam and Lexa are my core characters, and they become mentors for other key members of their TeamWork Missions volunteer crew as well as three of Sam’s siblings. Throughout this long series, each book stands on its own, but familiar characters constantly weave in and out. Readers will have the opportunity to revisit old friends, renew acquaintances, make new friends and fall in love with at least one new couple, and sometimes more (plus it’s fun when kids are added into the mix). The TeamWork crew is full of larger-than-life characters from all walks of life: the legal field, publishing, cattle ranching, teaching, catering, advertising…to a Wall Street broker, a politician, a spy and even a NASA shuttle commander! Their adventures will take you from Texas to Massachusetts, Montana, Louisiana, Austin, Manhattan and even to England, France and yes, the International Space Station. Love is everywhere with this bunch! Each installment of the series is full of love, life, faith, family and of course, romance! Could anything be more exciting than that first blush of love, or the reawakening of love? A God-fearing man. A God-seeking woman. For Sam Lewis and Lexa Clarke, it proves a combustible combination. Lexa Clarke signs up for a TeamWork Missions summer assignment expecting adventure in a far-off, exotic country. Instead, she’s sent to sweltering San Antonio to help rebuild homes destroyed by sudden flooding. She survives the four-hour bus trip from Houston, dust in the lungs, a flat tire, a tool-throwing incident and a spitting goat – not to mention an inquisition from a distractingly handsome cowboy – all before reaching the work camp. TeamWork director Sam Lewis isn’t sure what to think of his newest volunteer. She’s feisty, witty, and incredibly pretty, but looks more prepared to board a cruise ship than build houses. Burned by a past betrayal, he’s got a job to do, a reputation to uphold. Sam can’t afford to be distracted by a woman who attracts animals, defies his rules, finds trouble at every turn and questions God’s purpose. But when she tumbles from the top beam of one of the houses into his arms, Sam suspects his life will never be the same. During their weeks together in the TeamWork camp, Sam and Lexa learn the power of forgiveness and healing. Enduring a chain of incidents which challenge their faith, trust and growing relationship, they look to the Lord for guidance as together they discover a love greater than either could ever imagine. At the end of the eight-week work camp, Sam is committed to a year-long, dangerous overseas mission for TeamWork. Can Lexa trust the Lord enough to let him go? Will Sam safely return and keep his promise to meet her at The Alamo? You’ll keep turning the pages of this sweeping romantic adventure. 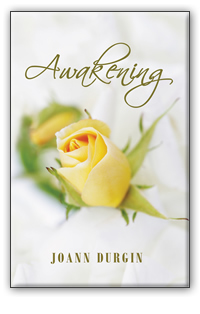 With great characters, plenty of humor, enough emotion to make you shed a tear or two, and a happy ending that’ll have you cheering, Awakening will leave you breathless. Hold on tight. The adventures of Lewis and Clarke have only just begun!